To find your dream home in an Austin Golf Course Community, browse pre-built search links below, or use our advanced search page to enter custom criteria for the homes you want to see. Learn more below, or contact us with questions. Browse luxury Austin golf homes for sale near the area's private clubs. Browse homes for sale in gated golf course communities. Build your dream home in Austin with a golf course view. Search by address, zip code, school district, view, subdivision, and more. 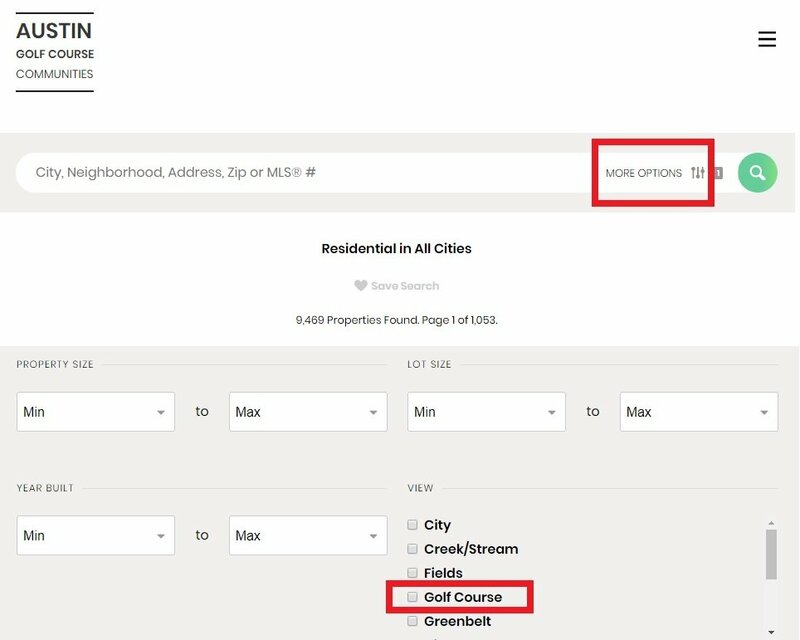 If you want to live in a golf course community and have specific features in mind, use our Advanced Search or select "More Options" at the top of this or any page on the website. Then, select your preferred features, such as homes where "View" equals "Golf Course." You can search by subdivision name, MLS number, city, zip code, price range, number of bedrooms, square footage, view, lot description, and area amenities. Choose features such as greenbelt or golf course views, cul-de-sac or corner lots, and public or private golf courses nearby. Add any other relevant criteria to help you narrow your search and then click "Find Your Home." If you know what you're looking for and search for similar properties each time you visit, you don't need to re-enter the search criteria each time; simply create a saved search for one-click access to your favorite search results. To save a search, enter your criteria and click the "Save Search" link above any search results page. Once you see a listing you like, you can save it for viewing later. When viewing multiple listings together in search results, click the star icon on the listings you want to save. If you're viewing an individual listing details page, click the star icon or "Save as Favorite" link next in the top right sidebar of the page. Don't see what you need here? Learn more about Austin Golf Course Communities, or complete the form below to contact us with questions.